The man who robbed a Lake George Mobil store Friday night is seen on surveillance. 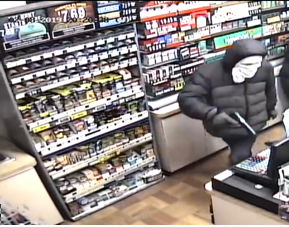 LAKE GEORGE — The Warren County Sheriff's Office is investigating a Friday night armed robbery at the Mobil gas station, 2398 Route 9N, in Lake George. According to the sheriff, the suspect entered the store 9 at approximately 8:20 p.m. with a weapon and ordered the clerk to open the cash register. The suspect proceeded to steal several hundred dollars in cash from the register drawer and then exited the store and fled on foot, police said. The suspect is described as a tall, slender male. At the time of the robbery the suspect was wearing a dark colored jacket, jeans, and full faced white mask. Anyone with further information, please contact the Warren County Sheriff’s Office, Investigator Edward Affinito at 518-743-2500.